Dennis Fehling has worked with many different dogs that need help with basic manners as well as more serious behavior issues like dog to dog aggression, dog to human aggression, dog separation anxiety, shy and fearful dogs, obsessive barking and many other problem behaviors and is very successful at solving these issues that his clients face with their dogs. There are many ways to train a dog; we focus on the positive aspects of training by using only proven scientific methods that rely on a force free approach. Dennis continues to educate himself through attending many seminars that focus on behavior and dog training. As a proud graduate of the Animal Behavior College Dennis learned the essential tools to train dogs and their humans through positive reinforcement. As a guild Certified Tellington TTouch practitioner and one of a very few men in this field of compassionate training Dennis is confident these tools along with the strong commitment to continuing education about all aspects of dog behavior enable him to get results through positive training with both dogs and humans. Pamela Bigoni has had years of experience working with many types of dogs especially the bully breed and is very adept at training puppies. 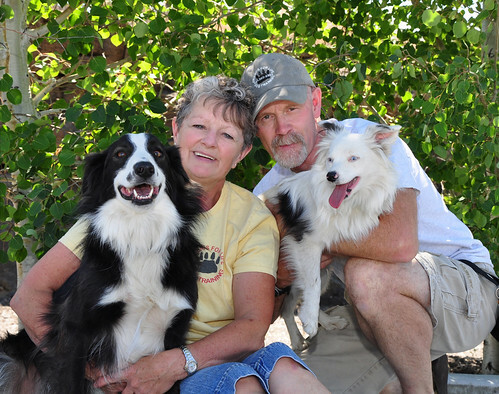 Pam volunteered for the Redmond Oregon humane society and was also on their board of directors. She was instrumental in the dog walking program at the shelter and in three years never missed a day rain or shine of walking dogs. She completed the Karen Pryor clicker training academy for dog trainers in 2010 and also attends many seminars to continue her education as a positive dog trainer. She will be attending the Instructor Training Course in accord New York in August with two of the best dog trainers and teachers in the world Pia Silvani and Trish King. Pam is also heading up our nose work classes and is pursuing the title of Certified Nose work instructor. Pam along with Dennis completed the Pet Tech first aid and CPR instructor’s course and teaches monthly workshops on pet first aid for pet parents, dog trainers, dog groomers, pet sitters, dog walkers and anyone in the pet care industry. Dennis and Pam share their lives with five rescue dogs Beau, Flash, Meika, Pawsey and Snickers who are both deaf dogs.